More interesting, though, is the rest of the bio. Most pro player life stories in poker magazines are fluff pieces that sound like they were written by the subject's publicist. This one is different. With what appears to be brutal honesty, it describes Booth's huge losses in the UltimateBlecch cheating scandal, his multiaccounting, how he went completely broke, how he lied to his backer, how he lied to friends to induce them to lend him money, how he lost $800,000 that he didn't have in illegal sports betting, how he is still working on making that good, and other topics that would make your average publicist puke. The article does not appear to be online, so you'll have to find a copy of the magazine to read it. In the meantime, you can relive his play against Ivey. It is commonly called a bluff, but Booth obviously knew that he effectively held the nuts. The only question was whether the 5 was coming on the turn or the river. I entered the MiniFTOPS $33 razz event this evening mainly so that I would have something to do while watching Cardgrrl play it. As she will gladly tell you, she is the Razz Queen. Last night, however, she had a terminal case of the runbads, and lasted only about 90 minutes, winning no more than two or three pots during that whole time. I, on the other hand, apparently had all the rungood for both of us. 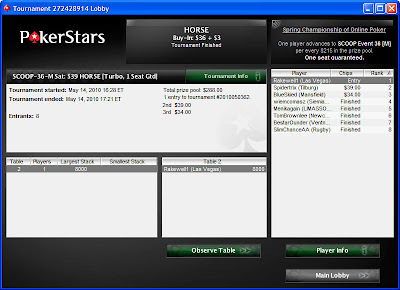 I lasted just under seven hours, finishing on the final table bubble, picking up a $450 payday. From about 45 minutes in until maybe 90 minutes from my demise, I was in the top quarter of the field the entire time, and most of it in the top 10%. This was not--I repeat, not--from world-class play on my part. I just played ABC, getting paid off by the hordes of calling stations when I made a strong hand, and getting away relatively cheaply otherwise. Not rocket science. I misplayed four hands during the tournament, as I see it. But I'm too frazzled to bother recounting them. Besides, razz hand histories are just too messy to slog through, and there is still apparently no hand replayer for stud/razz hands that would let me animate them for you. I also lost a big chunk in the late stages--when I could least afford it--on a misclick, of all things. I didn't know the break had ended, and was clicking on a web page, when suddenly it was my turn and my table appeared under my mouse, and the spot on the screen I was clicking was no longer a web link, but the "raise" button. I had accidentally 3-bet the table. Somebody 4-bet it, and since I had two low cards (including the up one), I called with fingers crossed. Caught another good one, so called another small bet, but then bricked and ran away. Dumb. Once I got severely short-stacked, I was in a perpetual dither about whether to play aggressively and hope to get lucky and be back in it, or hunker down and hope to slither up the pay scale. I mostly chose the latter, and survived two pay jumps longer than I had thought I would as a result, so I guess it sort of worked. But, of course, in the process I basically sacrificed all hope of being in the top handful. I had my fair share of good luck and bad luck, no extraordinary amounts of either. It was basically a "can't complain" scenario. It was perhaps a good warm-up for the HORSE event on Stars tomorrow afternoon, which, should I be fortunate enough to go deep again, will be many hours longer than this was, I suspect. Thanks to F-Train and AlCantHang for sticking around for moral support all the time I was on life support, and for the many good wishes from Twitter friends. Thanks most to Cardgrrl for being my motivation to enter the thing to begin with. Brad Booth, on meeting Guy Laliberte for the first time in a live $10/$20 game, and not knowing who he was, in All In magazine, Spring 2010, p. 73. One of the guys at the table was a French guy. Since I was Canadian, I asked him where he was from. He said Montreal, and we got chatting. I had no idea who he was, and he never said anything about it. 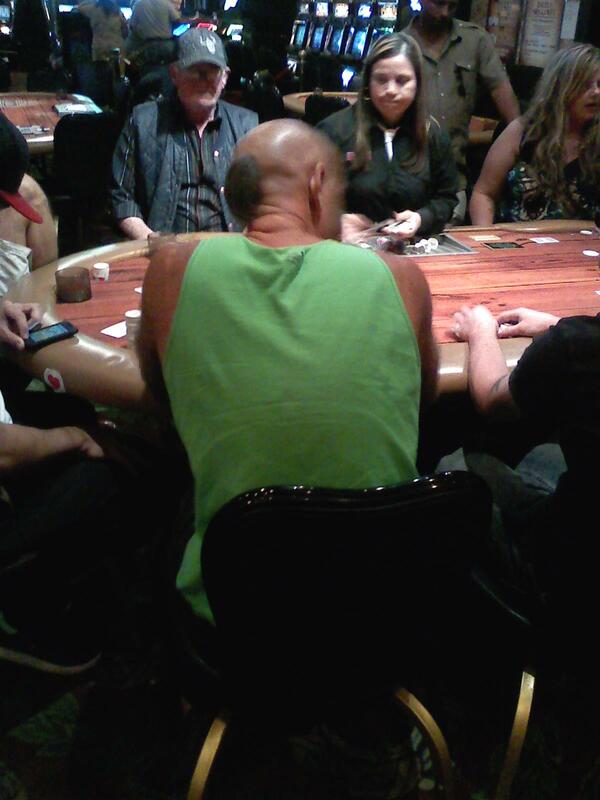 We hit it off, but it was obvious to me that he had no idea what he was doing at the poker table. He wasn't dressed like he had money, he just looked like a tourist, and he told me he was only in town for a week. I felt a little bad for him, 'cause I thought he couldn't afford to lose the money. There was even a hand where I had the absolute nuts on the river, and he checked to me and I checked behind. At one point, I even offered to give him some lessons and suggested he move down to the $1/$2 table so that he didn't lose as much. I remember him laughing and saying, "I'll be okay." Go read this great story from Foucault. That is all. 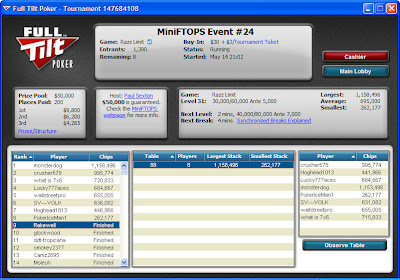 My friend Cardgrrl won a $215 SCOOP ticket in a blogger freeroll a few months ago. The other day she told me she had decided to use it on the HORSE event Saturday, 2:00 p.m. my time. I decided I would railbird the thing with her, and marked the time on my calendar. Today, while mentally sort of mapping out my weekend, I got to thinking that it would be a lot more fun to play that tournament with her rather than just sitting at home watching her play from 2400 miles away. However, $215 is more than I keep in my Stars account, and realistically I'm not good enough at HORSE to make it a sound investment of that much money. But I thought there must be satellites for it. I checked, and one was about to start. 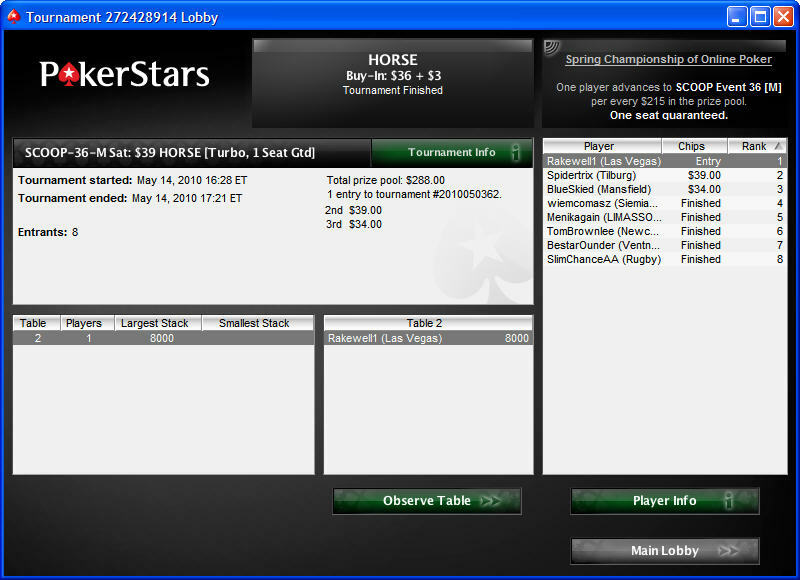 At the time there were only three players signed up, with one seat guaranteed, constituting a sizable overlay and +EV. So I entered. The overlay disappeared with some late registrations, but damn if I didn't manage to win the thing! It was a dreadfully uneventful experience, I'm afraid--no dramatic suckouts in either direction. 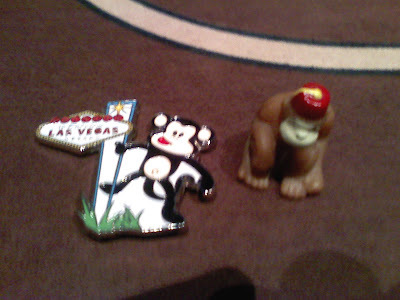 (OK, there was one--I hit a gutshot to Broadway on 6th street in stud to push over the edge a guy that was already on Super Monkey Tilt from a one-outer a couple of hands before. He was one of those idiots that claim to be better than everybody else in chat--you know the type, "If it weren't for luck I'd win 'em all.") I was never chip leader until we were down to four players, but I was also never below average stack. I entered heads-up play with a nearly 3:1 chip advantage, but the limits were so big by then that one big pot could change that around. I only called on 4th street because of having four to a low; it seemed unlikely that he would be making a low, so I was just hoping for a chop. (Yeah, I know, not the world's greatest strategy. Spare me the lectures.) 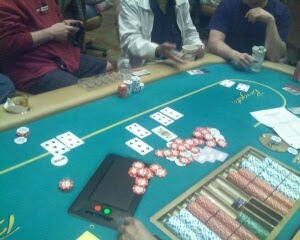 When he made trip aces on 5th and I secured my low, I was nearly certain we would chop it, so I was just calling behind. I was shocked when the entire pot came my way, and the screen announced I had won. I had not even noticed that I had a straight draw on 6th, let alone that I had hit it on 7th. As I always say, the best pots are the ones you don't expect to win. Want another example of how dense I can be? When we were three-handed, the other remaining player was the one on my immediate right. I caught myself thinking, "I hope that the guy on the left is the next one out so that when we're heads-up I have position." D'oh! I think I'm close to being dead money in the SCOOP event, but at least I'm only $39 of dead money instead of $215, and I think it might be $39 worth of fun. 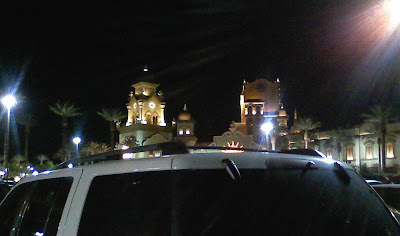 It's about a trillion-to-one longshot, but me and Cardgrrl finishing 1 and 2 in this event would be just about the only thing I can imagine, poker-wise, that would be more delightful than finishing 1-2 in a Mookie and the too-good-to-be-true way we ended a live session at the Luxor last year. My friend Cardgrrl has successfully migrated her non-poker blog to a new virtual home, after investment of some blood, sweat, and tears. If you think you might enjoy taking a few seconds a day to look at something beautiful, please peek in at www.somebeaut.com. You might also see if you can identify the fragment of photograph that sits behind the blog title at the top of the page. 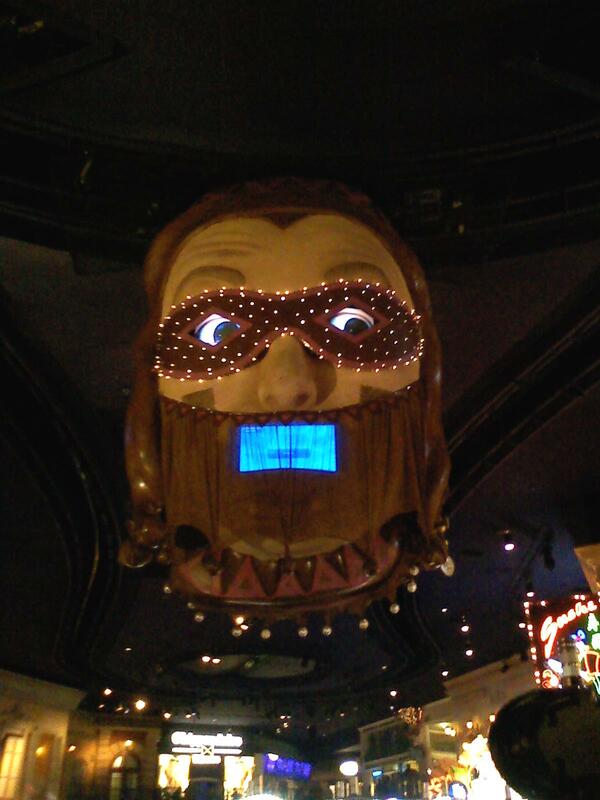 Hint: It's from a Las Vegas casino. 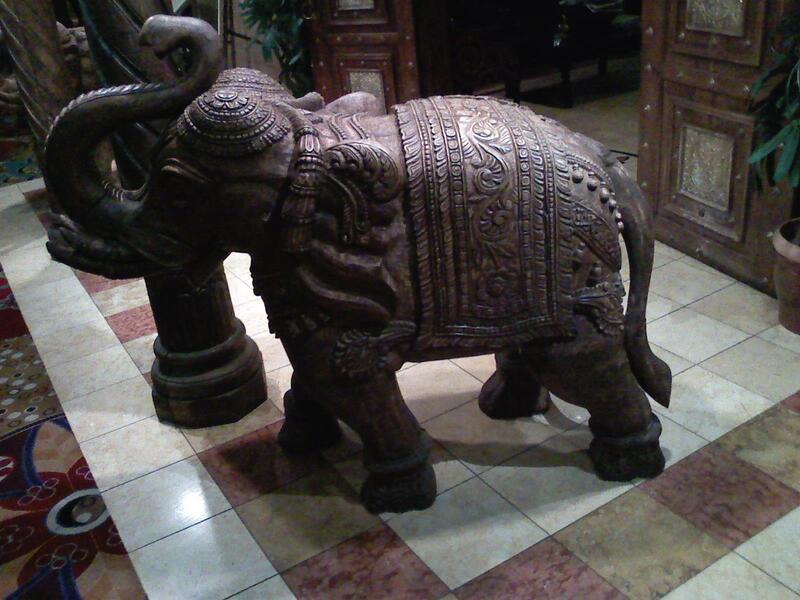 Second hint: By coincidence, the item shown was featured in a "Guess the casino" post here not too long ago. OK, one more bedtime story from today's MGM Grand session. It was a fun, lively group of players--the rare kind of mix that I can interact with pretty well without feeling uncomfortable. Among them was a Crazian, who was clearly well known to the dealers. He must play there a lot. It's not one of my most frequent hangouts, so I didn't recognize him. During one hand, he moved all in. His sole opponent was contemplating a call. In an apparent attempt to dissuade a call, Crazian said, "I look confident, don't I?" The other guy said, "Yeah, but you've looked just as confident when you were making the most retarded calls!" This broke the table into laughter, because we all knew it was true. Our Crazian friend had, for example, a short time earlier called a $70 all-in shove from the table rock pre-flop, holding the mighty Q-9 offsuit. Rock had Q-Q. Crazian won when the dealer put four of his queen's suit on the board. Fortunately, Crazian took it well and laughed along with the rest of us. I said, "The truth hurts, doesn't it?" He nodded. The dealer joined in, in faux shock: "You mean you've been playing not by the book again?" Crazian: "I haven't read the book. I've only read four books in my life." Random player: "And those were all Harry Potter." Gotta be careful what you say during a hand. Your tablemates may be ready to skewer you with observations about your play. 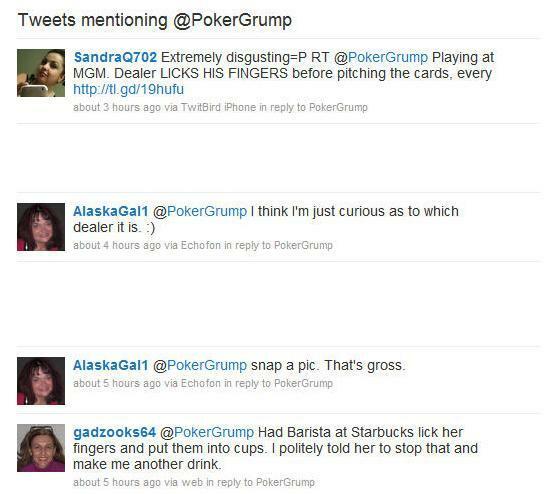 After having just excoriated one MGM Grand dealer for a filthy habit, I think I should commend another one for handling a situation just right. The dealer, Bob, did just the right thing. After one such incident, he reached out to a spot 12 or so inches in front of the player, patted it with his hand, and told the player, with a friendly smile, "If you just park 'em right here, it doesn't slow the game down at all." I thought that was the perfect one-sentence speech. It clearly told the player that he was, in fact, slowing down the game, without actually saying, in an accusative manner, "You're slowing down the game! Cut it out!" It was done with such grace that not even the snarlingest curmugeon could have taken offense. It told the player exactly what was being requested of him, and why. It took only five seconds. Most impressively, it actually had the intended effect. There aren't many things I see that make me think, "That was perfectly done." But Bob's little reminder there did just that. NH, WP, sir. I did an afternoon session today at the MGM Grand. 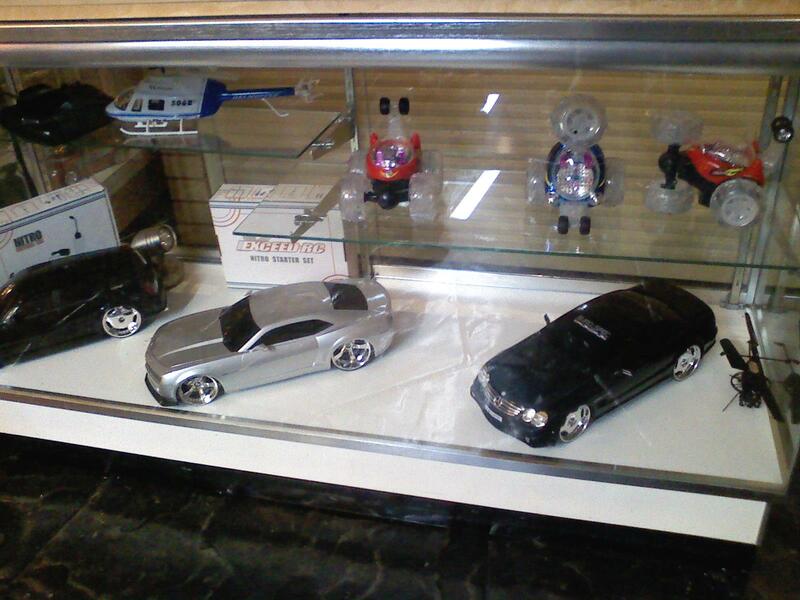 The second dealer in the box was the man pictured above. His nametag says "Sammy." On one of the first hands he dealt, I thought I saw him touch his fingers to his tongue just before pitching the cards. It was completely unexpected, though, so I thought maybe I misinterpreted something. I watched more carefully on the next hand--and he did it again. And again. And again. And again. Sammy licks his fingers before every deal. Specifically, he licks the tips of the index and middle fingers of his right hand. He is left-handed, so this seems even stranger than it would otherwise be. It took me a while watching him to figure out what was going on. He doesn't use a standard dealer's grip on the deck. He has those two fingers all the way around the cards, but the fingertips aren't grasping the edge of the deck as one would usually expect. Instead, he uses them to help feed (from underneath) the next card out so that it can be grabbed by his dominant left hand. I have to assume that a little moisture on the fingertips aids in this function. But, EWWWW! Has he never thought about what he's doing? 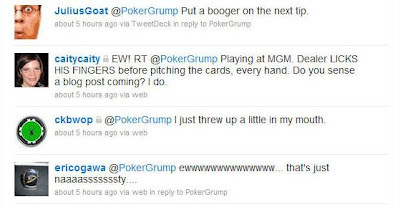 Does he really think that what poker players most fervently wish for is that the dealer adds his saliva to the cards before dealing them? I have watched hundreds of poker dealers over the last four years, and this is only the second one that I've seen lick his fingers as part of his routine. The first one was working at one of the most disgusting poker dives in the county, Jokers Wild in Henderson. I wrote up that experience when it happened, back in August of 2007, here. stickier than average (as were the chips). To the Jokers Wild dealer (you know who you are): Dude, you is NASTY! 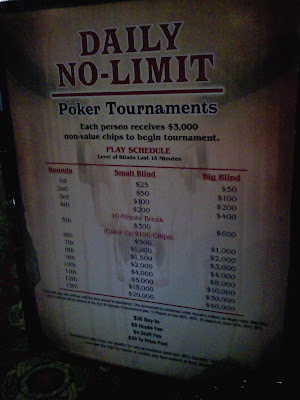 I would not be as surprised if I had seen this at some other horrid little poker room, like Terrible's, or Hooters, or the Tuscany, or Stratosphere, or Sahara, official home to the worst poker dealers in the city. But at the MGM, one of the five or six largest poker rooms we have here? 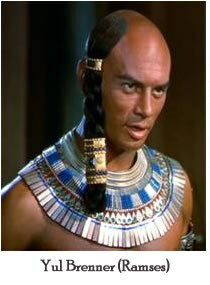 In my experience, MGM dealers are usually top-notch. I have come to expect--and observe--high standards of professionalism among them. 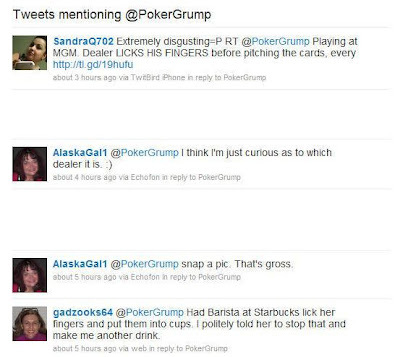 To the MGM poker room manager: Why do you tolerate this? I mean, I can't really be the first and only person who has ever noticed and complained about this, can I? It's not exactly subtle or hidden. He does it every single hand. Do you really want to be ranked with Jokers Wild in terms of the griminess of your dealers? Do you not care about spreading cold and flu viruses among your players, and between your dealers and players, and from one dealer to the next one that will handle those decks of cards? I sure hope that putting spit on the cards doesn't void the warranty of the Shufflemasters. 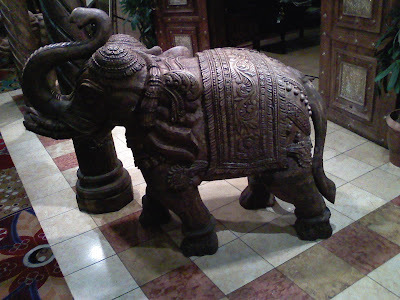 To my readers: I am going to try hard to get this post in front of the eyes of the poker room manager at MGM. If I get a reaction with permission to publish it, I'll add it in an addendum here. But whether I do or not, please help me follow up on this. 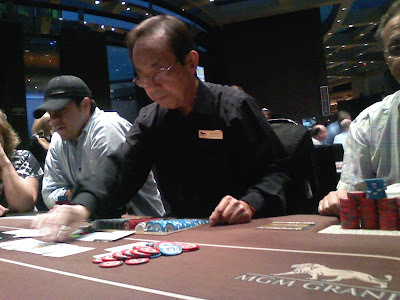 If you play at the MGM and you see Sammy in the box, watch him. If he continues this vile practice, ask him to stop, and/or speak to the shift supervisor. Right now they may claim (dubiously) not to have known about it before, but if it continues after they have been unequivocally put on notice that it is happening, then we will necessarily have to infer that it's because it's perfectly OK with the casino's management. They endorse the addition of dealers' bodily fluids to the cards and chips that you handle. Let them know how you feel about that, won't you? While playing at the MGM Grand this afternoon, two players near me were using monkeys as card protectors. That need to be memorialized, I thought. I borrowed them both. But I blurred the photo in my haste to get the picture taken between hands. Sorry. I wonder if having a monkey in front of you helps prevent Super Monkey Tilt? I just got home from a late-night session at the Sahara. During the course of the poker game, one player had occasion to utter the following sentence to another: "If you hadn't taken out your teeth, I would have won that pot." I opined to the speaker that those exact words had probably never been spoken at a poker table in the entire history of the game. There is, of course, a story behind why that sentence was appropriate. But (1) it's way too late at night and I'm too tired for a long post, and (2) I think it might be more fun to just leave you all wondering! I just don't like calling with full houses. I like one pair, or ace high. Ilari Sahamies (who apparently has hired Phil Hellmuth as his poker etiquette coach), in the Full Tilt Poker chat box, on January 30, 2010, upon losing a $602,000 pot to FTP red pro Cole South, as quoted in All In magazine, March, 2010, p. 85. 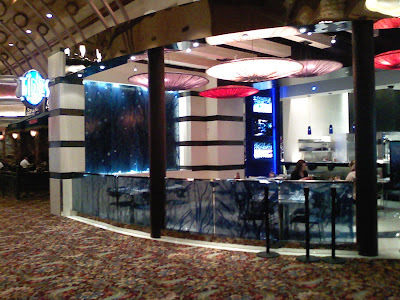 By interesting coincidence, this afternoon at Planet Hollywood I encountered a situation in which I vountarily showed my cards, quite apart from the various circumstances and categories I mentioned in the post earlier today. I had been at the table only about ten minutes, so was still figuring out who did what. 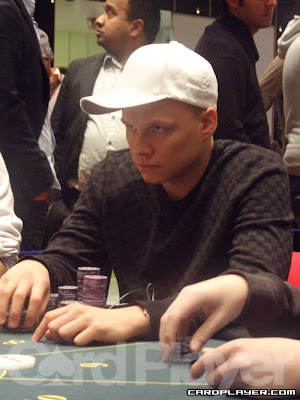 But within my first couple of hands, I had easily spotted the most dangerous player at the table. He had obviously played a ton of poker, and had a mien of strong, quiet confidence about his play. The first hand I watched him play, I thought he was just trying to blow his opponent off of a hand, until he turned over the nuts. When I'm that far wrong about another player, it's a big red flag that I'm going to have to handle him carefully. So, of course, that's who I am in the hand with when I have to make my first big decision. I have 8-9 offsuit in the small blind. There are three limpers ahead, so I join in, as does the big blind. Flop is Q-8-9, with two spades. (I have none.) I bet $8, about the size of the pot. It folds around to Mr. Dangerous, who raises to $20. My choices here are to reraise or just call. Calling is pretty cheap, and gives me a pull at one of the four cards I would most like to see on the turn. However, it doesn't give me any more information, and if I don't hit one of those four cards, I'm going to have a problem on the turn: If I check and he bets, or if I bet again and he raises again, then what do I do? I won't be able to tell if he is just playing a top-pair hand (e.g., K-Q), two pair, a set, or a straight, and my decision will be both difficult and potentially expensive. I decided instead to reraise. I thought that he was smart enough that he would not continue any one-pair hands past that point. If he flat-called, a draw would seem most likely--perhaps a combination straight and flush draw. If he reraised me back, I could then be highly confident that the minimum he had was a better two pair. Most likely in that scenario he would have flopped a straight, since my holding 8-9 made all of the two-pair combinations and sets less likely. 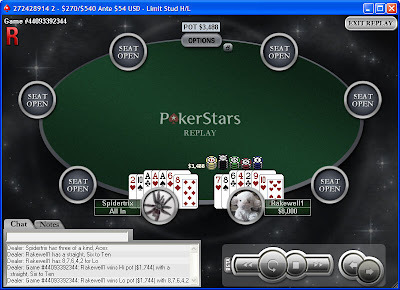 (I assumed that a set of queens was basically out of the question, with no pre-flop raise.) Besides, I learned a long time ago that people have an abnormal fondness for J-10, and anytime the board makes that a strong hand, I am on the lookout for it being hidden away under somebody's card cap. So I made it $60. (I had started the hand with nearly all of my original $300 buy-in.) He thought for about ten seconds before moving all-in. It would cost me about $130 more to call. Just about the only hand that he could plausibly be holding that I would currently be beating was something like Q-10 of spades, giving him top pair, flush draw, and gutshot straight draw--and even if he had that, I'm not thrilled about getting a lot of money in with that many bullets to dodge twice. Furthermore, his radar on me is probably as alerted as mine is on him. If so, he would have to peg me for being solid enough to have a minimum of two pair with the reraise. Given that, his willingness to shove speaks volumes. Most likely I have four outs, and it might be just two. In fact, should he have 9-9, I'd be drawing virtually dead. Not a good spot. I stuck with my plan and folded. But I thought it was worth seeing if I could get some confirmatory information out of him. For the reasons explained in my earlier post, I don't like to verbally request somebody to show. Once in a while, though, I will silently invite it by showing my own hand. This was one such occasion. I turned my cards in to the dealer face up. I didn't fire them in with anger or frustration, or make any face or sigh that would tend to say, "I just want you all to see how screwed I got in this hand." I have no respect for that kind of pathetic, sympathy-seeking display, and wouldn't think somebody else would either. It worked. He nodded my way and flashed his J-10 before mucking. I gave the table a couple of quick knuckles in acknowledgement. I was pleased to learn that my read on him was better than it had been in the first hand I had watched him play. I thought I got the more valuable side of this information exchange. I like that kind of transaction. This may not be rational, but I'm much more inclined to reciprocate, just as Mr. Dangerous did today, to a silent revelation than I am to somebody who verbally makes the request. I'm not entirely sure why, but the former seems more mutually respectful to me. It doesn't always work, being on the initiating side, but I don't think I'm giving away too much in the attempt. I've fallen behind in blog reading over the past several days because I was using Safari as my RSS reader, and it has crapped out on me. I've made the switch to Google Reader, but it took a while, and now I have some catching up to do. That's why I'm just now getting around to reading my friend Katkin's story about a recent hand in which a woman folded to his large bet, but got upset that he wouldn't show her his hole cards, as she requested. This triggers a whole bunch of only semi-collected thoughts on my part. 1. Mike Caro, not suprisingly, has given the whole question of whether and when to voluntarily show one's cards a great deal of thought. It's another subject that he has written about many times in many places, but most of it is summarized in an old essay he just put up on his web site a few days ago, here. The answer, as with most things in poker, is, "It all depends." It's all about the meta-game--manipulating opponents into making mistakes, manipulating their emotional states, manipulating your table image. Sometimes those goals are best furthered by showing, sometimes by not showing. 2. On one of the early seasons of the World Poker Tour, they did a little feature in which they asked a bunch of well-known pros what they thought of the voluntary showing of cards. Some were adamantly against it: "Never." Some were pretty casual about it. But I thought Daniel Negreanu had the best answer, which was, basically, "Sometimes--but always have a good reason for it." 3. I show sometimes without being asked, sometimes when asked. Again, it all depends. I can't say I'm as methodical about it as Caro advises, but there is at least some logic to it. It mostly depends on whether the nature of the table is such that I think I'll maximize my profits by inducing more calls or by inducing more folds. 4. I will occasionally show just one card. It's always the relevant one, though--e.g., the ace if there was an ace on the board. That is, I never show just the one blank hole card for the needling effect or to make people think I might have been bluffing when I wasn't. 5. I never, ever show just one player my cards. I firmly believe that the "show one, show all" principle confers on me an ethical obligation to be non-selective in revealing hole cards. I resent it when another player shows selectively, thereby forcing me to request the dealer to show the cards if I want equal access to the information he is giving away. I don't want to put others in that spot, so I either open the hand for all to see, or I don't show it to anyone. 6. About needling/irritating opponents: It's pretty rare that I will do so deliberately, but if somebody is of a temperament to get all hot and bothered over something as trivial as me not agreeing to show my cards when requested, let him start steaming. I won't go out of my way to provoke him, but if he has a hair-trigger personality to begin with, I usually won't try to assuage him. If he's prone to thinking I'm mean-spirited for not showing, fine, so be it. If he decides to target me with increased hostility and aggression as a result, bring it on--he will necessarily be making a strategic mistake, which I will hope to be able to take advantage of. 7. Pace Caro's perpetual advice about keeping everything light and fun and tension-free, I think there is definitely some psychological benefit to making opponents keep wondering. The more they are inclined to ruminate and wonder and stew over whether they made a good laydown, the less inclined I am to show. Once in a while, if I think an opponent will be tortured by not knowing, I will say, while mucking, "Sorry, you're just going to have to lose some sleep over that one." But that's a line I always deliver with a big smile. 9. If somebody gives me the "Will you show if I fold?" line, I will either say nothing or reply, "I can't promise you that," as my default answers. But once in a while I agree to it. There's no specific formula to when I agree; it's kind of whimsical, depending on my mood, whether I like the person asking, how tough the game is, whether I'm winning or losing, etc.--plus, of course, the general strategic point mentioned above about how I want my advertising to go. If I'm being asked to show after the hand is over, I will either just shake my head to decline or say, "I can't do that." Sometimes I'll even sweeten it with a little flattery: "You're too good a player to give extra information to." (That's sometimes even true.) But in that situation, I won't say anything unless I can do it in a pretty friendly, lighthearted way. 10. On the rare occasion that I'm in a big hand against a friend, I'm much more likely to show when it's over than I would be otherwise. I don't want unnecessary tension between us. 11. As far as I can recall, I have never asked an opponent to show his or her cards. As far as I can recall, I have never asked an opponent to tell me what he or she had. I don't see the point, since any answer is as likely to be a lie as the truth. I also don't want to give anybody else the satisfaction of having the power to either grant or decline my request. The more I project an image of not caring what he had, the better it is for me, I believe. It's also better for me to try my best not to care--a goal that would be frustrated by verbalizing a request. There is a rare exception to that. 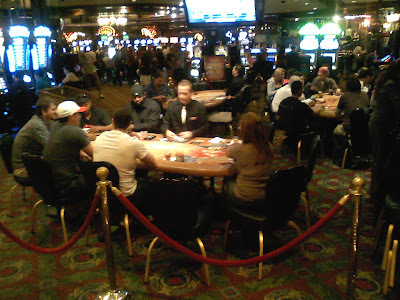 Maybe once or twice a year, at most, after a long session, I will engage some specific player in a discussion of a key hand or two that we played. I only do this (1) away from the table, (2) when one or both of us is leaving for the day, (3) when it's a player I have come to respect, and (4) when I have some information about hands that he might want in trade for what I might want. I think I have done this sort of thing maybe four times in four years. 12. When I first became interested in poker, I bought Wilson Software's simulator program and worked with it a lot. 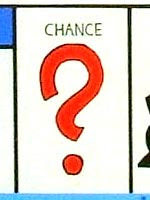 In the lower levels of play, it gave you the option of looking at your opponents' hole cards after the hand was over. But when you moved to the most challenging setting, that option disappeared. After playing for quite a while at the lower settings, and getting into the habit of always looking, I found it immensely frustrating to try the highest level and not be able to find out whether I had done the right thing. But I have since gotten used to not knowing. After all, in real poker one usually doesn't get the luxury of knowing, even in retrospect, what one's opponent held. That's just the way the game is. If I were the woman in Katkin's story, reluctantly folding, I would tell myself something like this: "I think it is more likely than not that he had a better two pair, or possibly even A-10 for trips. It's possible that he was overplaying something like J-Q and I had him beat, but this game is soft enough that I don't need to put all my chips at risk in a marginal situation like that, when I'm not confident where I stand. There will be plenty of opportunities when I know I have way the best of it. I'll be content to wait for a better spot than that one was." If he showed me a better hand, I'd just shrug and think, "That's about what I figured. OK, next hand." If he showed me a decent but weaker hand, such as J-Q, I'd tell myself, "That's OK. Folding there was still reasonable, because most of the time I would have been in trouble. But it's good to know that he's capable of overplaying a hand like that, because it's a mistake he'll make again sometime when I have position and/or a stronger sense of being ahead, and I'll be able to stack him." If he showed me a total bluff, I'd tell myself, "OK, pal, you got away with that one. But I just learned what you look like when you're bluffing, and unless you're much better than the average $1/2 player at camouflaging yourself, I'll have a better read on you next time." I don't suppose my actual thoughts are quite that well-formed, but that's the general idea. I am a big believer in self-soothing via internal monologues. I'd love to be able not to think about it at all, instantly let it go, and be completely focused on the next hand. But my mind control isn't that perfect, so I resort to this kind of self-talk, which helps me more quickly close the mental book on that hand and get fully back in the moment. I have argued before, and continue to believe, that it really doesn't matter what your opponent had, in terms of whether you feel good about the decision you made. It's a game of incomplete, imperfect information. You make your best judgment call and go with it. Sometimes you're right, sometimes you're wrong. All that matters, for profit, is that you're right a higher percentage of the time than your opponents--especially in the biggest pots, when whole stacks are on the line. After-the-fact presentation of additional information to which you could not have had access when you had to make the decision is perhaps useful for the next encounter with that opponent, but it shouldn't affect how you feel about the decision you made any more than rabbit-hunting to discover whether you would or would not have made your draw. It's pointless to either congratulate or berate yourself retrospectively for not knowing what was unknowable. I'm struggling with finding a clever wrap-up line here. Sorry, can't come up with one. Saturday night after my successful hit-and-run at Hooters, I wanted to put in another short session someplace else, and I was in a mood to try to get somewhere I haven't been in a while. I have wanted to get out to Club Fortune. 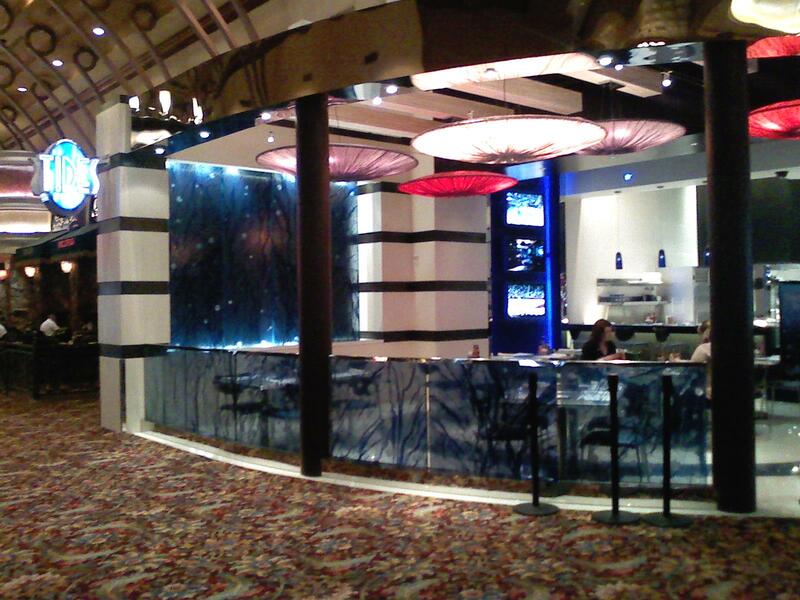 They've opened a new poker room since the last (only) time I was there, and I hear it's quite nice. But I've called a bunch of times, and they never have a no-limit game going. Last night the woman on the phone told me that it's very rare that they have one, so I might have to bite the bullet and just drive out there anyway, knowing that it will likely be a $2/4 LHE I'll be in. But I'll do it for my readers. That's just the kind of guy I am. Anyway, then I tried the Tuscany. It's a place that sits at the very top of my records in terms of average dollars won per session, but I call and call and call, and just cannot catch them having a no-limit game there anymore. It used to reliably run one at least weekend evenings, but that has not been happening lately. They are apparently desperate; they have twice lied to me, telling me that they were just starting a game, but when I get there, nothing. So last night when the guy told me at about 8:30 that they would "for sure" have a NLHE game up by 9:30 and that it would run all night, I had my doubts. But I stopped by anyway at around 11:30. Nope. I was then pretty close to Bill's, so finally decided to make that my evening capper. I had not played there since September, so it was due for a visit. $30 entrance fee, of which only $20 goes into the prize pool, so 33% juice. Combine that with 15-minute levels, only 60 big blinds to start, and blinds doubling nearly every level, and I think we have us a strong contendor for the title of Worst Tournament Structure in the History of Poker. There were eight players being seated. If I joined, that would mean a prize pool of $180, or a profit of $150 for a couple of hours of work if you were to win (assuming that they made it winner-takes-all). Suppose that my skill edge is such that I have a one in three chance of winning, instead of the one in nine chance that it would be if all were equally likely to win. That would make my EV for entering the tournament about $50. I think I'll pass on that. I tried it, and it was perfectly decent. The Burger Joint is not exactly the most upscale place you could eat, but it will do in a pinch. It follows the modern trend of being way, way too loud (about which, see this interesting recent article). And while I'm at it, you kids get off of my lawn! It's also not the cleanest place I've ever eaten. 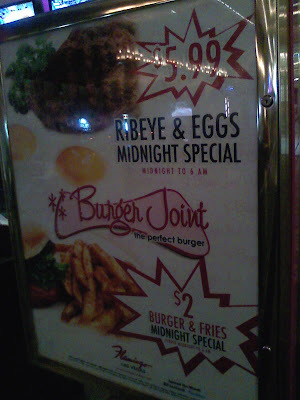 But there were no hidden catches to the $2 special, and it was entirely acceptable, as such things go. I even splurged an extra 75 cents each for cheese and bacon on it, because my coronary arteries have been feeling just way too open lately. 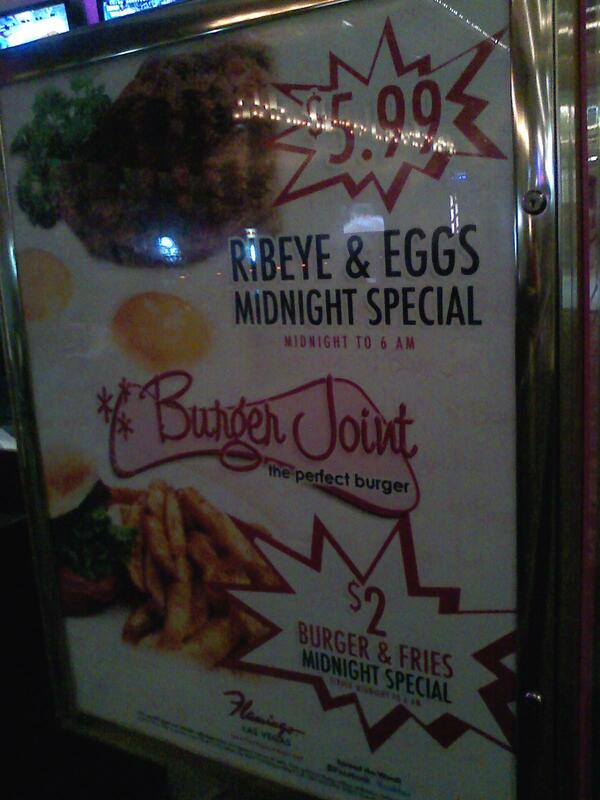 Some night I might even go back and try the steak and eggs special. the winner, and $3k for everyoune else dealt in the hand. I've read lots of stuff from Mike Caro over the years, in both books and columns in periodicals. I think it's safe to say that I've learned more from him than from any other poker writer. One temptation is to try to out-do the bully, to punch back even harder than he is hitting. The problem is that you are pretty much reduced to flailing away wildly, like Ralphie in A Christmas Story when he finally loses it and goes nuts on the bully Scut Farkus. (Can't embed that clip here, but it's always worth a re-watch, don't you think?) It might work, but it's risky and costly. In the poker setting, it also leaves you wide open to being exploited by other players who are smart enough to wait to trap the two of you with a monster when you're trying to out-bully each other with mediocre holdings. The other temptation is to cower, to go into highly defensive mode, to tighten up even further, waiting for the rare premium hand before playing back at the bully. There are two problems with this. First is that you're missing out on lots of money that the bully is putting into pots with weak hands which you could win if you were braver. Second is that even minimally intelligent bullies will notice the guy who punches back only once an hour. He'll just fold, giving you one pathetic little pot for all your patience and consternation. often. When an opponent makes a mistake, there’s always a way to take advantage. you can relax your calling standards and still make a profit. making. Stick to the one-two formula I just presented. Last night I was ever so grateful to have taken this advice to heart. I was playing at Hooters again. The place is a rathole of a poker room, but I've been heading there more often recently, since they stopped allowing smoking at the table. It is chronically populated by bad, drunk, fun-loving players. There's a lot of annoyances to be tolerated, but it has proven to be highly profitable. One guy at the table last night raised the first five hands in a row after I sat down. I can be a slow learner, but that was enough to get even a clod like me to realize we had a bully on our hands. My first action was to change seats, taking an open one two spots to his left, so that I had position on him eight out of ten hands. He stole my blinds liberally, but I didn't mind. Except for maybe the top ten starting hands, I did not want to play against him from out of position, so I just conceded the nothing pots. Then I gave him the Caro treatment. A little observation revealed that the bigger his bets, the less he had, and the more he was trying to just push opponents off of pots. 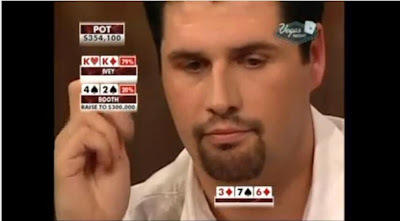 When he occasionally had a big hand, he made smaller value bets, trying to induce calls. That meant that I had to screw up the courage to call three big barrels with ace-high, or middle or bottom pair. But it worked to perfection. I did deviate from the prescribed plan twice with raises on the river. Once I had, well, less than nothing--draws that had missed. But I had gained some decent amount of respect and reputation, so when he bet $40 on the river in a situation where I couldn't give him credit for much, I raised to $120, and he folded in about three seconds, saying, "I can never beat this guy." 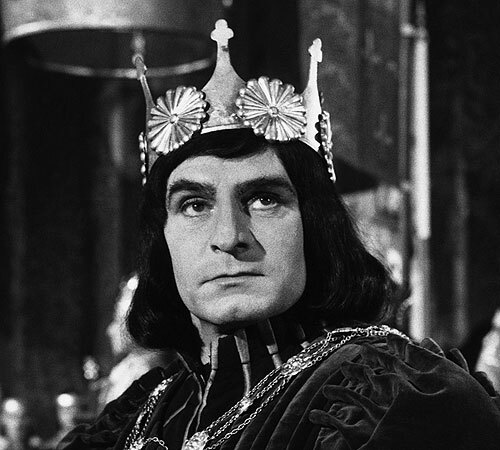 The other time was when I rivered a queen-high flush that I was certain was good. This was one of the rare times I was out of position. I checked. He bet $100, and I check-raised all-in. He folded, this time saying, "I'm done trying to bluff you." The result? Uptick $399 in 1.8 hours, or $218/hour. If you don't think that's pretty good for a $1/$2 NLHE game with a $200 max buy-in, you haven't played it much. The really interesting thing was how my reaction to him changed how the other players handled him, too. I rather quickly acquired the table's biggest stack, and once while stacking the chips from a sizable pot that I won from the bully by calling him down with just a middle pocket pair, one of the other players looked at me and said, "You're my hero!" It was obvious that the bully had been frustrating them for quite a while before I came along. But they picked up on what I was doing and started emulating it. By the time I concluded my relative short session, the bully had gone from big stack to busto, and had had to rebuy twice. He was becoming the one who was frustrated, because he was being called down much more frequently than before. The bully had been exposed to be a weakling in disguise--a fraud. The one thing no bully can endure is being stood up to. Once the bully's victims see that he can be beaten, they are eager to get their licks in, too. It gave me considerable emotional satisfaction to see them join in taking his money, and to watch his frustration mount. He wasn't a sophisticated enough player to adjust profitably; he had only one shallow bag of tricks, and kept resorting to it even when his losses were accelerating. I love the simplicity of the strategy of just calling the bully. Of course, sometimes he gets lucky and hits something big, and you look pretty foolish calling three times with not much of a hand. But in the long run, those instances are far outweighed by both the monetary effect of his too-frequent bluffing and by the psychological effect that you have on him by not backing down to his attempts at intimidation. Bob Ciaffone, in a Card Player magazine column a few years ago, penned a wonderful apothegm that neatly sums up the concept: "We know you can fight fire with fire, but what is wrong with fighting it with water sometimes?"